I am continually amazed at how much I have learned about the restaurant industry from writing a food blog for nearly three years. Of course, it seems obvious that if you study something for that length of time, you would naturally pick up a few things along the way, but that honestly wasn't why I started Exploring Food My Way. One of the two most important lessons I've learned so far is that despite your server being the primary point of contact with a restaurant when choose to dine out, slow or "off" service can be caused by far more than just the server's lack of experience or enthusiasm. Knowing when to legitimately gripe about service takes time to develop. The other important lesson I've taken away from this experience is the extreme volatility of the food service industry as a whole. Servers, cooks, chefs, heck, even the restaurant itself can be there one day and gone the next. I know a server who in one year worked in thirteen different restaurants. That isn't to say that there aren't some longtime stalwarts that have been around for forty, fifty, or even one hundred years (restaurants, not servers). These are clearly the exception to this generalization. Back in February of this year, fellow photographer and camera salesman extraordinaire Dan at Campus Camera, upon finding out that I write restaurant reviews advised me about a restaurant that was serving up great food, Shorty's Subs and Salads. Even better, the restaurant was just down the road from the camera store. I didn't have time to try it that day, but I returned with a few days to find the restaurant oddly dark at a time when it should have been open. Between the time Dan had told me of the restaurant and a short while later, they had closed up shop. 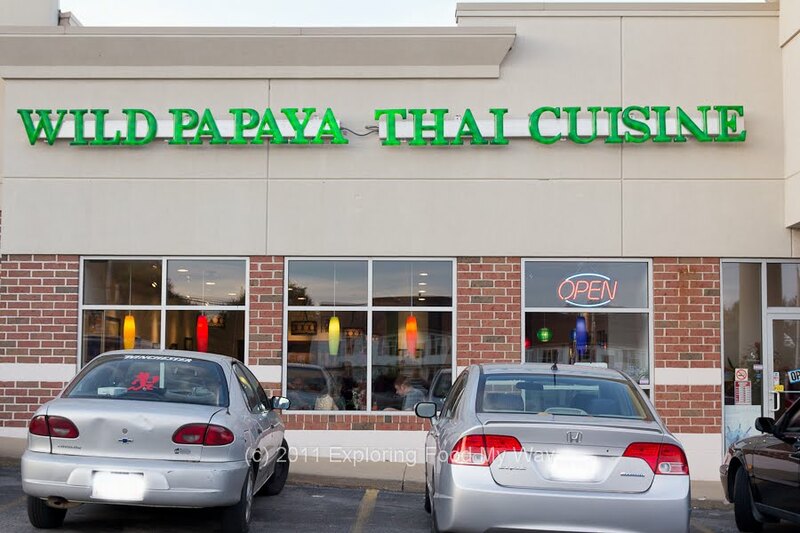 Wild Papaya Thai Cuisine was located at 1665 East Main Street, Kent, OH 44240 and can be reached at 330-677-0916. Parking was in the large lot in front of the building. You can check out their web presence by visiting their website or their Facebook page. Since I never managed to eat a meal at Shorty's, I was unfamiliar with how the interior looked before Wild Papaya took over, but I have to say that the decor was quite contemporary with a bit of traditional Thai art thrown in for good measure. When I arrived, I was one of only two tables that were occupied. I'm happy to say that within thirty minutes, another six or seven tables were seated. Staying with the traditional version of this salad, tonight's dish was made with green papaya which had yet to ripen. Thus, the fruit wasn't particularly sweet (think green tomatoes versus ripe tomatoes). 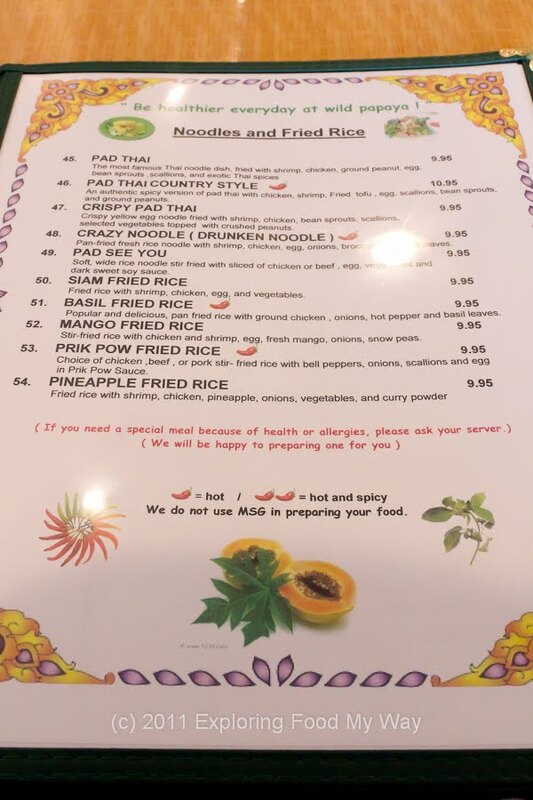 The papaya had been shredded thinly along with carrots and had been dressed in a dressing of nuoc cham -- typically a mixture of lime, fish sauce, chile, cilantro, sugar, and rice wine vinegar. 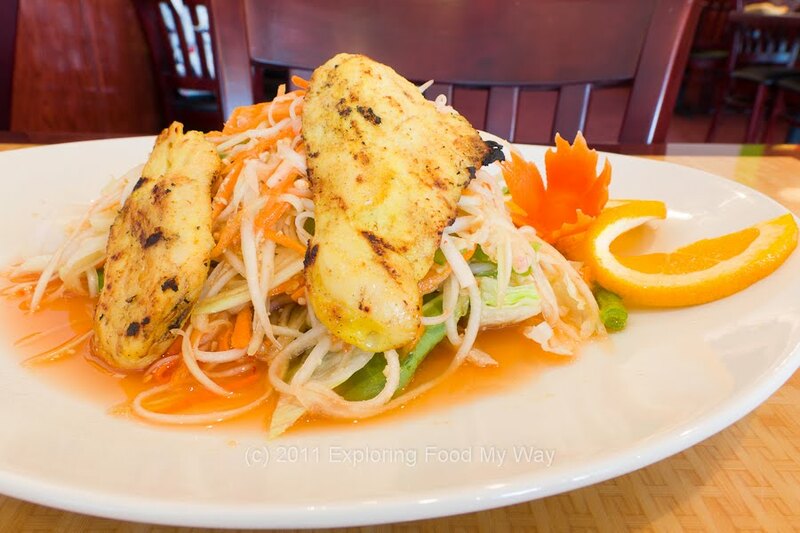 This combination of flavors gave the papaya "slaw" the qualities of sweet, salty, spicy, and acidic. 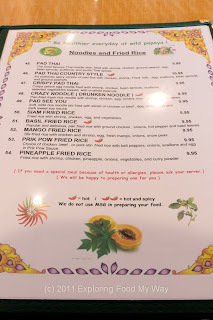 All of the flavors were nicely balanced and the spiciness of the chile was quite subtle, yet still present. The two yellow hunks of meat placed on top of the salad were chicken that was hot, juicy, and nicely grilled. 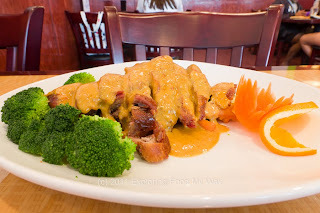 I could tell based on the flavor of the chicken that this was the same protein used for the satay appetizer. The salad was actually quite large and could definitely be split among two or three diners. My only complaint was that two pieces of chicken seemed a bit light for the amount of salad on the plate. A third piece would have rounded this salad out to the point where one person could eat it for their entire meal. 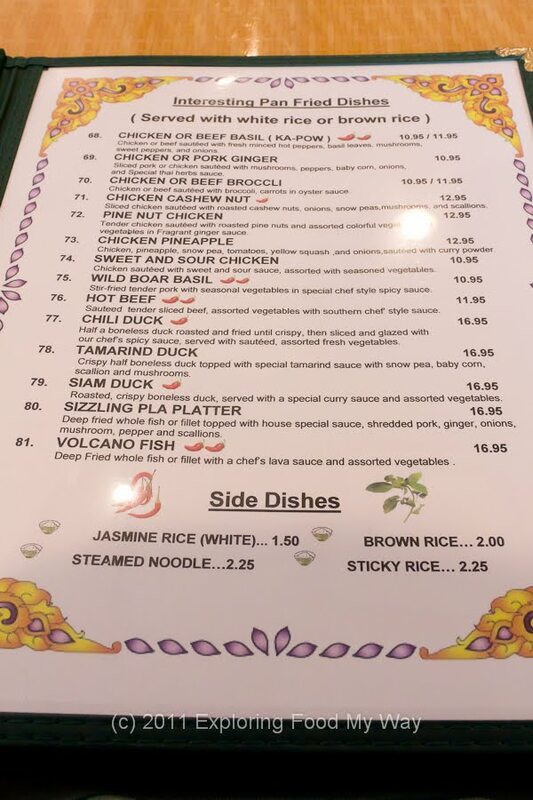 Before I talk about the Siam Duck, I would just like to go on record as saying I really appreciate an Asian restaurant having both steamed white AND brown rice available for diners. 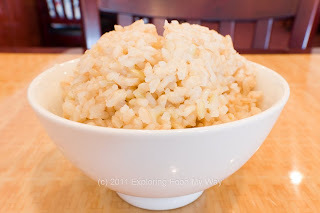 While I certainly don't mind white rice, I know that brown rice is slightly better for me and knowing that it is available, I will always order it over the white. 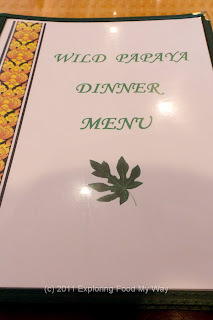 To make it even more enticing, Wild Papaya gave me the choice of either to accompany my meal at no extra charge. Anyone who has ever watched me evaluate a meal for the blog knows that I rarely dig into a dish thoughtlessly. If the protein has a sauce on it, I taste it. 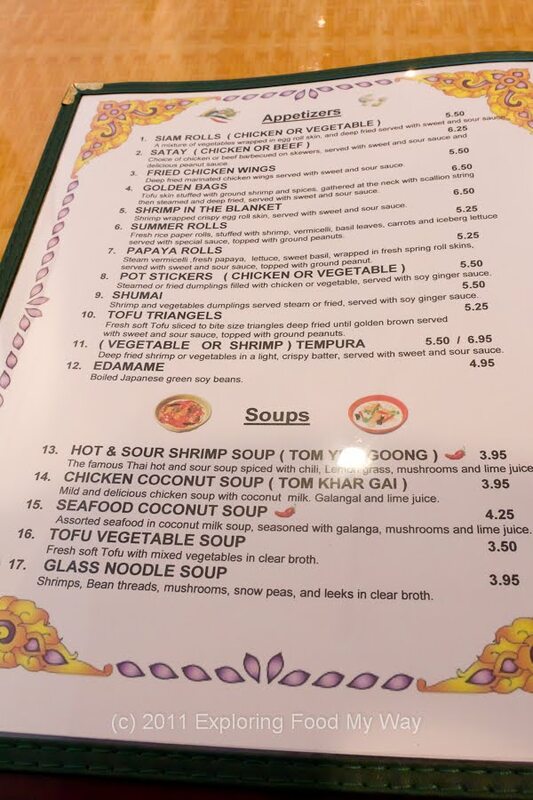 I tend to taste components of the entree before taking the all-inclusive bite. 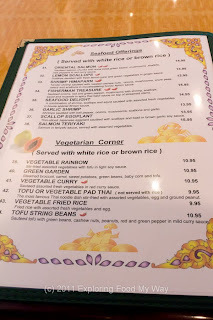 I had been hesitant to order an expensive entree (one of the most expensive on the menu), but upon getting my first taste of the yellow curry, my taste buds exploded with nervous energy signalling the "YUM!" center in my brain. I suddenly realized I was in for a epicurean roller coaster ride. The sauce was complex, sweet and salty with a hint of vinegar to balance it out. 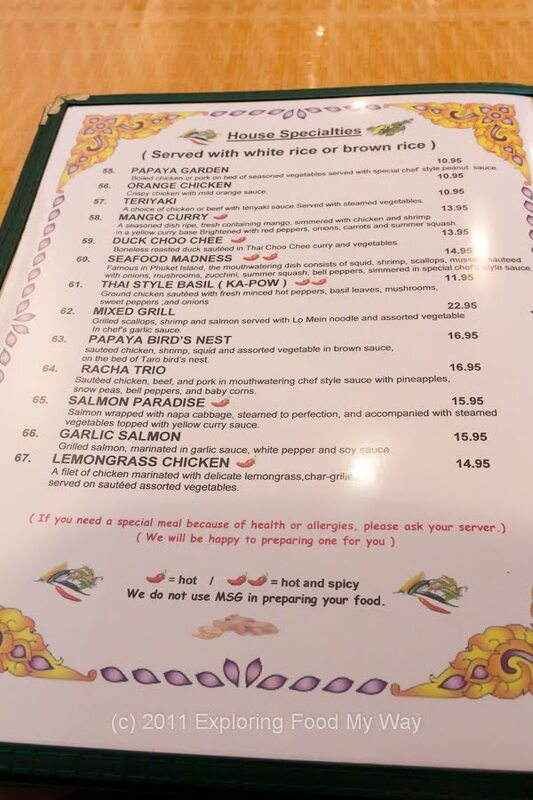 While the menu listed the dish as being served at "one chile pepper" which meant hot, I asked for the dish to be served at "two chile peppers" meaning hot and spicy. While I certainly could've handled much more heat, the spice level was a nearly perfect match for the extraordinary savoriness of the sauce. Honestly, gentle reader, you could have put that sauce over a leather boot and it would've been good. The duck, which had been clearly finished in the deep fryer due to the crispiness of the skin, was moist and juicy and the skin was crispy without being greasy. Because duck has a thick layer of subcutaneous fat, it must be rendered off during the cooking process or else the result is chewy, rather unpleasant fat that is often better removed than consumed. Tonight's duck wasn't the best I had ever eaten, but I would say it was deftly prepared and tasted very good. 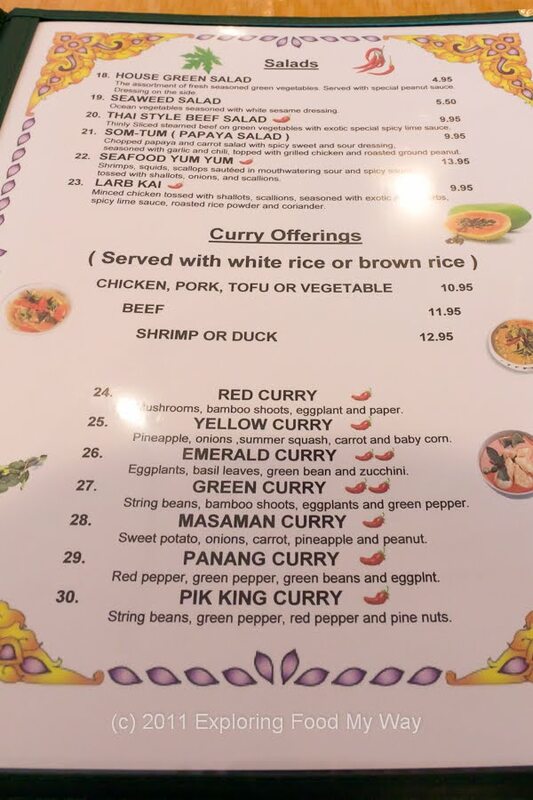 Combined with the yellow curry, it was an absolute home run. The broccoli, while steamed, was a bit on the lukewarm side and while the squash and zucchini were softened from the steaming process, the carrots were crunchy to the point of being noticeable. Those minor quibbles aside, whatever I didn't finish at the restaurant (which was about half), I took home with me and eagerly consumed the next day for lunch. 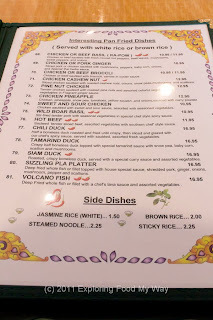 While not as good cold as it was hot, just the thought of the curry sauce accompanying the Siam Duck made my mouth water like the unwitting subject of a Pavlovian experiment. 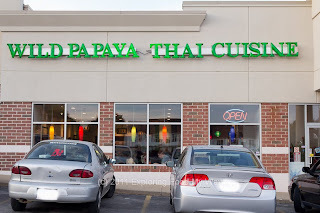 Dinner tonight at Wild Papaya Thai Cuisine wasn't inexpensive at roughly $28 for my meal with water and tax. That being said, I had enough food for two complete meals at $14 each which isn't bad if you are watching your wallet and need a place to split dinner for two. While this might be a tad on the pricey side for your typical Kent State student, it also means that the place won't be overrun with college students looking for food on the cheap. 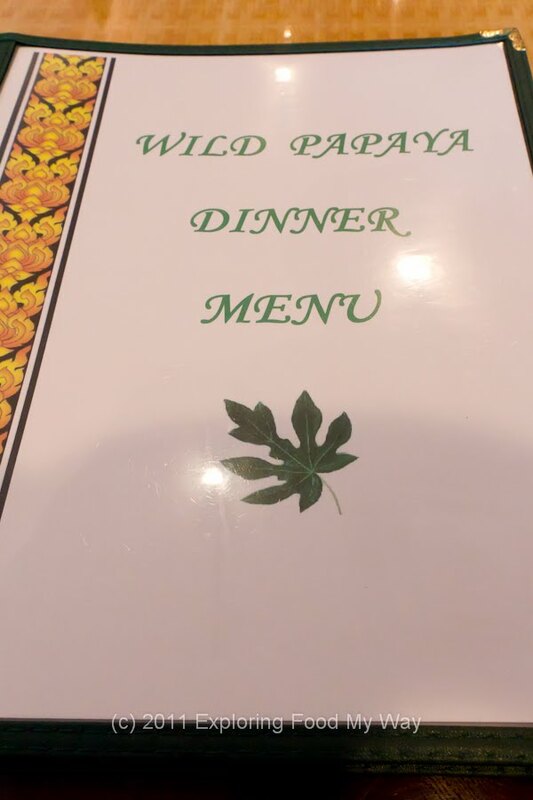 Needless to say, I recommend that you give Wild Papaya Thai Cuisine a visit to try out the Tom-Sum and Siam Duck for yourself. I currently live on the west side of Akron and I would be more than willing to drive the thirty minutes each way just to have another dinner there. Of course, now that I have tasted this amazingly wonderful curry, in order to try other items from the menu I will undoubtedly have to bring friends with me when I return; hopefully they'll be willing to trade a bite of heaven from my plate for a bite of theirs.